Whether you're a serious golfer aiming to lower your handicap, a weekend warrior, or a family looking for some fun with the kids, Baehmann's Golf Center is the place for you! 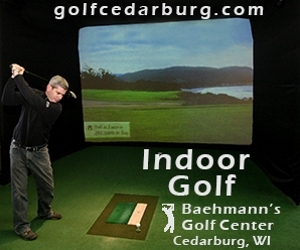 We also have an Indoor Golf Simulator to get you through our Wisconsin winters! Come play any one of 134 courses from around the world, including St. Andrews, Torrey Pines and TPC Sawgrass. Our full-service Pro Shop has equipment for everyone from beginners to experts. Edmund "Bud" Baehmann can work with you to find the ideal set of clubs that will last for years. We also provide Repair Services like regripping, reshafting, shortening and lengthening. For only $4 each we can cut down and regrip your old clubs (or our own) for your child just learning to play. To improve your game, our 9-hole Par-3 course is the perfect place to sharpen your short game, with our longest hole at 120 yards and elevated greens. It's also a great low-stress environment for beginners and kids to learn the game. We also feature one of the hottest new games around, combining Soccer and Golf, FootGolf! Players kick a soccer ball down the fairway to a larger 21-inch diameter cup that's cut off to the side of the golf greens. It's a lot of fun and anyone can play! Located 10 miles north of Milwaukee, 4 miles west of I43, 10 miles east of Highway 41. Contact Baehmann's Golf Center at 262-377-0768 for more information and details on holding a golf outing at the course. Contact Baehmann's Golf Center at 262-377-0768. Contact Baehmann's Golf Center at 262-377-0768 for onsite or nearby dining options. Golf Simulator, over 130 courses to choose from! We are proud to offer a state-of-the-art Indoor Golf Simulator, giving you the opportunity to either practice your game, or just enjoy golfing with some friends while it’s snowing outside. Just like our Pro Shop, the Simulator is open year-round. You have your own TV so you can watch the game while golfing with your buddies! This profile was last updated on 12/18/2018 and has been viewed 24,025 times.